My secret pal was so thoughtful! She saw I was going to take a sock knitting class and she tailored my pre-birthday gift box accordingly. Contents: two balls of Cascade Fixation in lavender (yay! 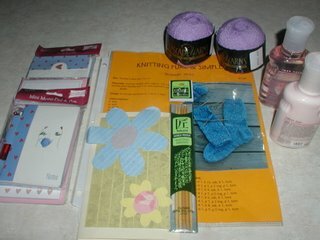 ), a set of #5 dpns in bamboo (my favorite kind), a knifty-looking sock pattern by Knitting Pure and Simple (it looks like I could almost do this), shower gel and lotion from Bath and Body Works in Sweet Pea (because of the cardigan? ), another cute handmade card, and teapot stationery supplies. Thanks so much, SP! It is nice getting a package a little early. I am not always that patient waiting for a day to arrive. Dh can attest to that!